Wow! I think that hits the nail on the head in a few areas of my life! How many of our patterns of behavior have become unproductive, and worse yet, hard to change? One of those areas, for me lately, has been my relationship with my husband. I have been married for over 22 years to my best friend, but yet those times of monotony still creep in. Recently we found ourselves slowly falling into some of those dry “patterns of behavior” once again, but we sat down last weekend and talked about how we could keep things alive and well between us. Right there is Lesson #1: When something is not right, TALK ABOUT IT. Do not let it go unchecked. It will just fester and add to the things you are already anxious about. After we talked, I felt this peace settle over me. I knew that it would take time but we were on our way to something better, something fresh. Lesson #2: It is not easy to bring up hard topics but the resulting peace is so worth it! Let me explain how this went down. Shortly before this talk we had, my husband asked me what I needed to do over the weekend. HA! Seriously? Where do I start?! I took him to two different rooms in our house that were just sucking the life out of me and proceeded to tell him, “There is just so much I need to do, I don’t even know where to start!” These rooms had just become laden with piles and everywhere I looked something needed to be put away. I love to organize and I have all these great ideas, but most of it takes money and money is tight. So, instead I just get on Pinterest and dream about how those rooms will look someday, and nothing gets done. So, Saturday I did what I could but it still didn’t feel like enough. I came away still feeling overwhelmed, and I don’t know about you but when I am discouraged in one area, it just takes over. Suddenly, everything in my life is unfulfilling and I am on a downward spiral. The anxiety builds and pretty soon it has to come out. For me, this happens with a good cry. Sometimes I feel sorry for my husband and all I put him through with my crazy emotions, but he patiently listened as we had a talk that really needed to happen. The process was messy but the outcome was full of grace. I’m not sure at what point this idea began to form in my husband’s mind, but later that night when I was gone with two of the kids, he went to work on his little plan. As I walked in the door that night, I could tell instantly by the look on his face that something was up (he is not the best secret-keeper). He sent me to our room and I could not believe my eyes! Everything was moved and it was all how I imagined and more! He left me an entire blank wall with plenty of space for a desk and whatever else I want to there to inspire my creativity. I can’t begin to explain to you how much this blessed me, but also how refreshing it feels to walk into my room now. I am even making my bed everyday now just to keep up the look (I know, wonders never cease!). So, pay attention to Lesson #3: If you let someone in on the things that are suffocating you, you just might be able to breathe again. The loneliness evaporates and you feel empowered by the relationship instead of depleted from it. One step forward can have a domino effect. 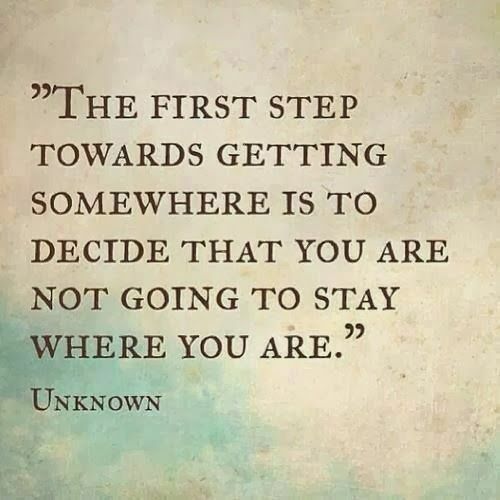 Take some time and think about what that step might be for you. Then TAKE that step, let someone in, and be amazed at what blessings are set in motion. Great blog! I love your honesty! Giving me much food for thought about some much needed conversations! Thanks, Mom! It means so much that what God is teaching me, He is also using to encourage my own mother. 🙂 Love you!